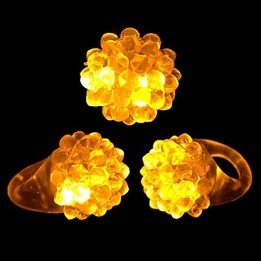 The flashing LED bumpy ring in color orange is an accessory of celebration for parties, special opportunities, festivities for the Halloween. As bright jewels or as accessory of decoration, these rings will please as much the adults as the youngest. Sold in packs of 24, these transparent rings made of silicone measure 1,5 inch of length and 1 inch of wide. Not at all cumbersome so they transport easily to your various night activities. To activate the orange light for a duration of more than consecutive 24 hours, you press in the center of the ring and you have to make the operation again to deactivate it to protect the duration of luminosity. This bright product is not recommended for children under 5 years old.